Want to reschedule or delete messages for a particular new hire, manager, or buddy? Here's how. 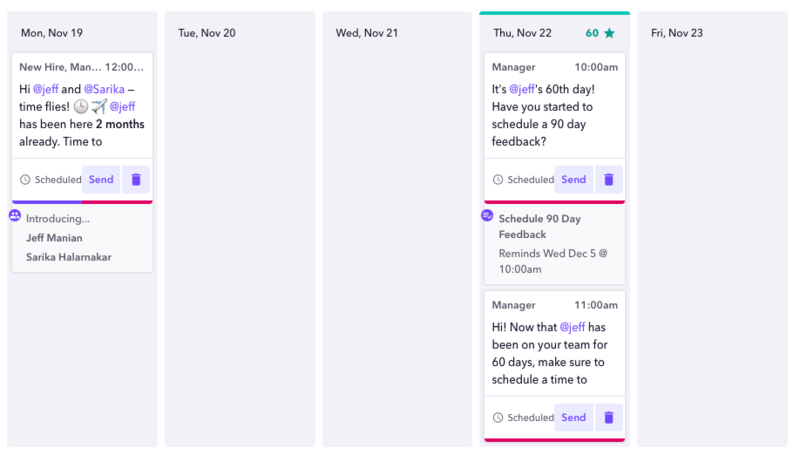 Editing a template changes the date and timing of messages for everyone receiving that template—but what if you know that one of your managers is sick and will be back next week? Or that one new hire out of an entire class shouldn't receive a particular message? Go to the New Hires tab, and select the class containing the new hire, buddy, or manager using the purple arrow to the right of the screen. Find the new hire (or the new hire associated with the manager or buddy) you're looking to edit, and hit the purple arrow next to their name. You'll see a calendar of individual messages. Scroll to find ones that are scheduled (rather than already delivered) to find the one you're looking for. If you're looking to reschedule a message, select the message and drag/drop onto another day. If you're looking to delete a message, select the message and drag towards the trash can that appears in the center bottom of the screen.